Over the centuries traditions, rituals and unique icons have gathered like age lines on the face of the Camino. They lend the pilgrimage an endearing, antique charm. Pilgrims fresh from the hard streets of Warsaw, Seattle, Madrid, even Canberra, embrace them with enthusiasm. 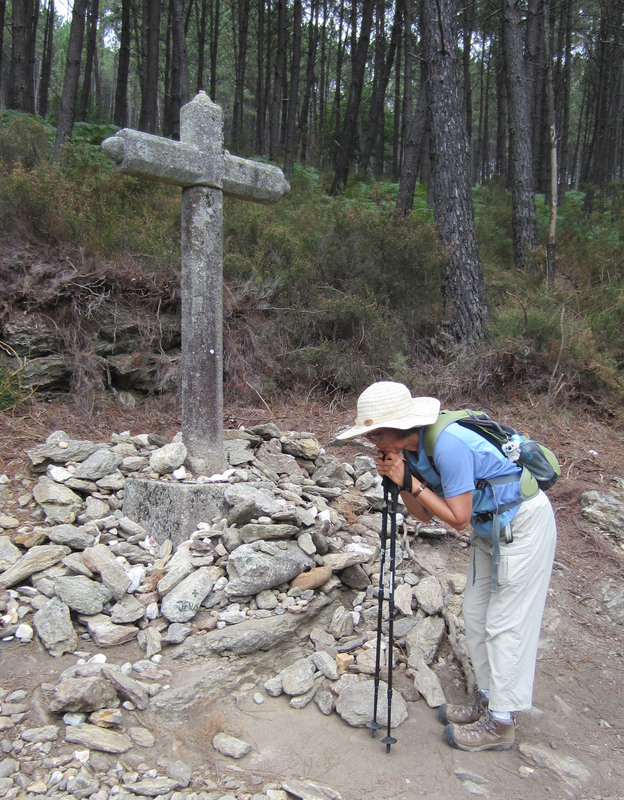 Some seem to believe very genuinely that the Camino’s rituals bring them religious illumination and merit. Others may be looking for some vague connection with the past. 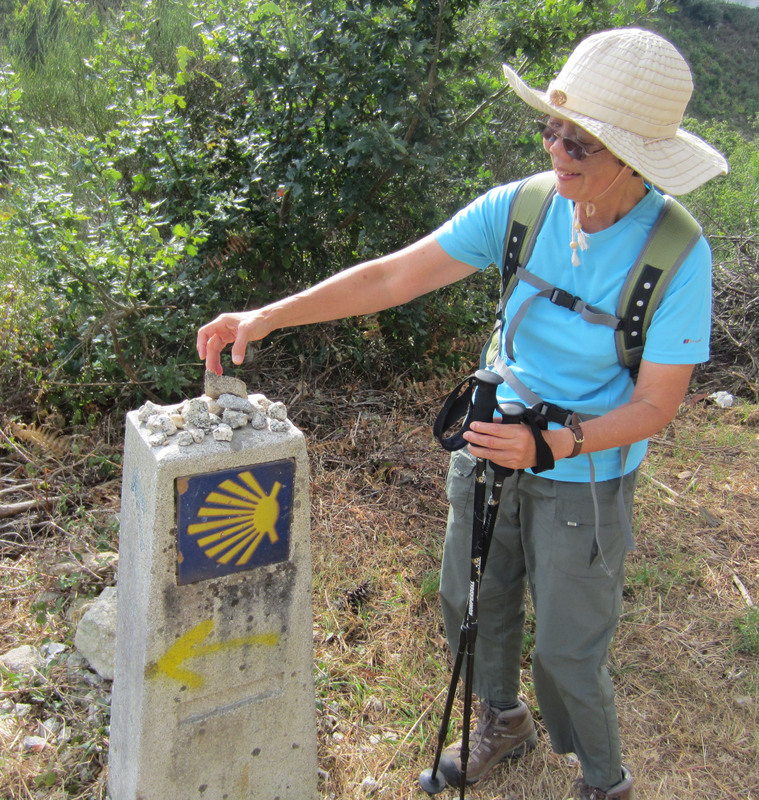 Quite a few, perhaps more than a few, are simply and sincerely hoping that, as they walk the Camino, they are “doing it right”, like tourists solemnly stumbling through an exotic local dance at their resort hotel. 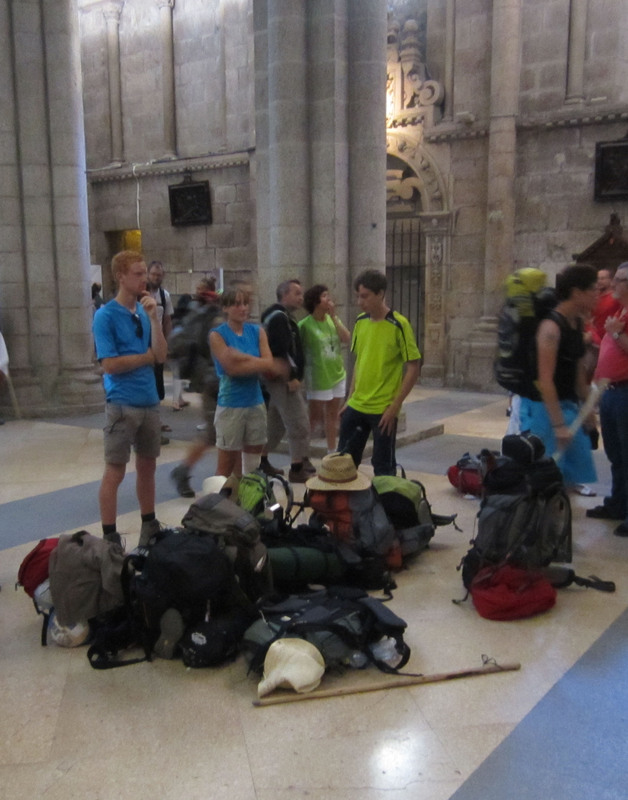 Many of these trappings are still to be seen in the Camino pilgrimage four hundred years later. The scallop shell, the staff (today more commonly a telescopic carbon-steel walking pole), the pilgrim’s menu (the quality of which sometimes threatens to deliver you more quickly than you expected to the realm of immortality), the calabash gourd bottle (today replaced by steel or plastic bottles, even by “camel-back rehydration bladders”)… all these and more still extend their offer of symbolic authority to the modern pilgrim. In their current incarnations they can connect us to the distant past, though there is no doubt that today their power as religious symbols has weakened. Here are notes on some of these rituals and traditions as I experienced them on the Via Portugues in July 2011. The yellow Camino arrow with (pointing in the opposite direction) the blue arrow of the pilgrimage to Fatima in Central Portugal. 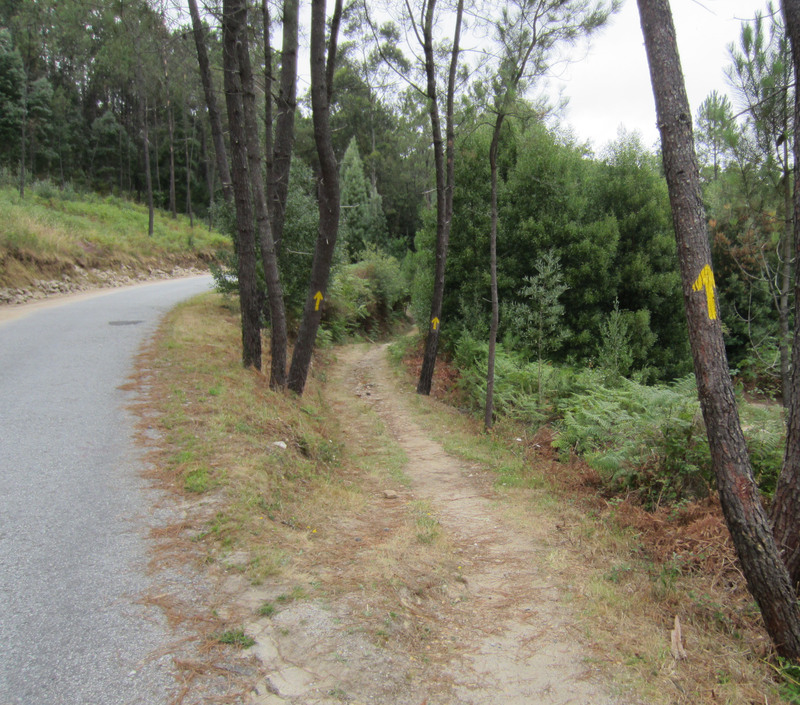 Along all the branches of the Camino you will find yellow arrows pointing the way to Santiago de Compostela. They appear on walls, trees, roadside milestones, footpaths and in formally painted signs. Mostly they have been put in place, and are re-painted from time to time, by pilgrim support organisations. In northern Portugal they appear every few hundred metres. Occasionally they are no more than a few metres apart, especially at intersections or in places where there might be doubt about the correct way forward. The yellow arrows are less frequent on the Spanish leg of the Via Portugues, but there are still plenty of way markers in the form of tiles with the scallop shell motif (see below). 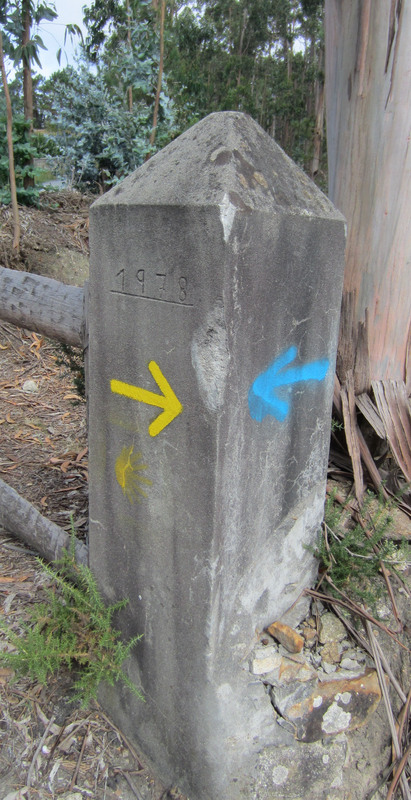 Like many traditions along the Camino, the yellow arrows are not as old as they are sometimes taken to be. 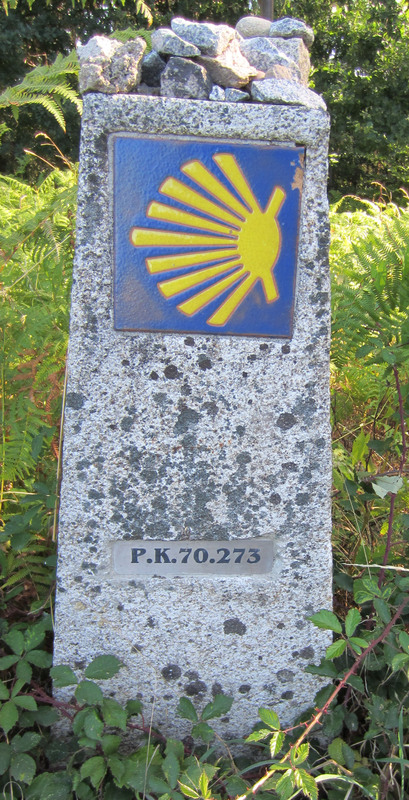 In fact their use as way markers dates back no further than the 1980s, attributed to Don Elias Valina Sampedro (died 1989), a priest of O Cebreiro parish on the Via Frances to the east of Santiago de Compostela. 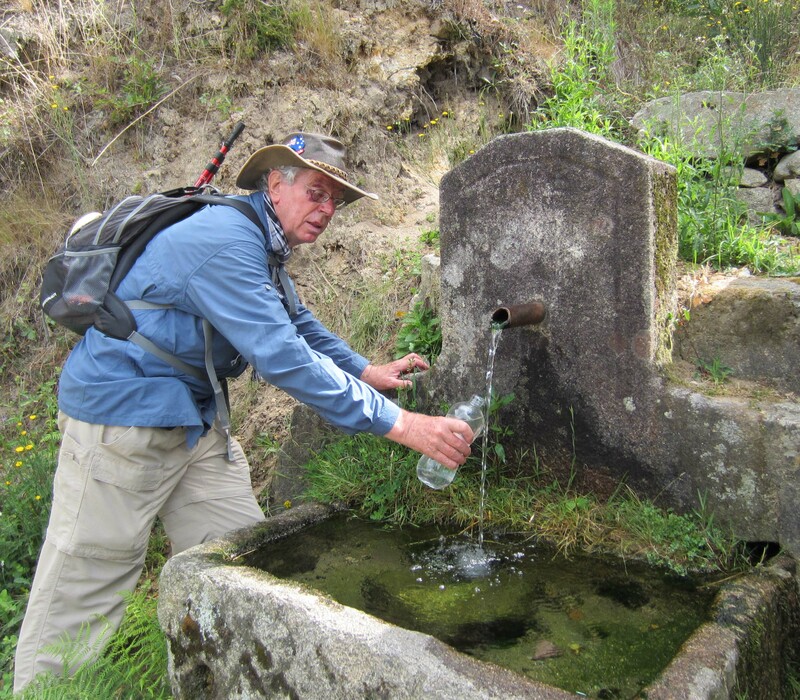 He pioneered the restoration of the Camino pilgrimage in the 1970s and 1980s. In Portugal the now ubiquitous arrows first appeared no more than 10 years ago. Don’t follow the asphalt road! Three arrows on tree trunks direct you down a side path in northern Portugal. 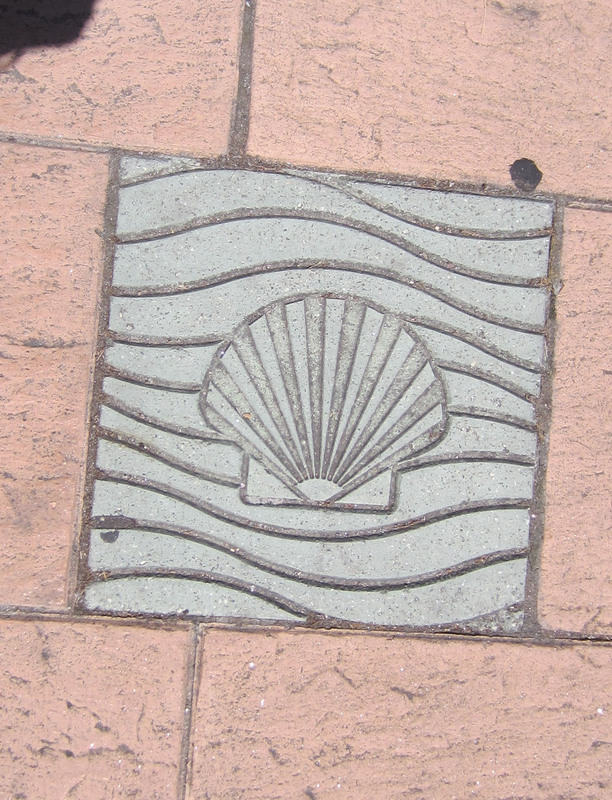 A scallop shell tile on a wall approaching the outskirts of Santiago de Compostela. Version 1: After James’ death, his disciples shipped his body to the Iberian Peninsula to be buried in what is now Santiago. Off the coast of Spain a heavy storm hit the ship, and the body was lost to the ocean. After some time, however, the body washed ashore undamaged, covered in scallops. 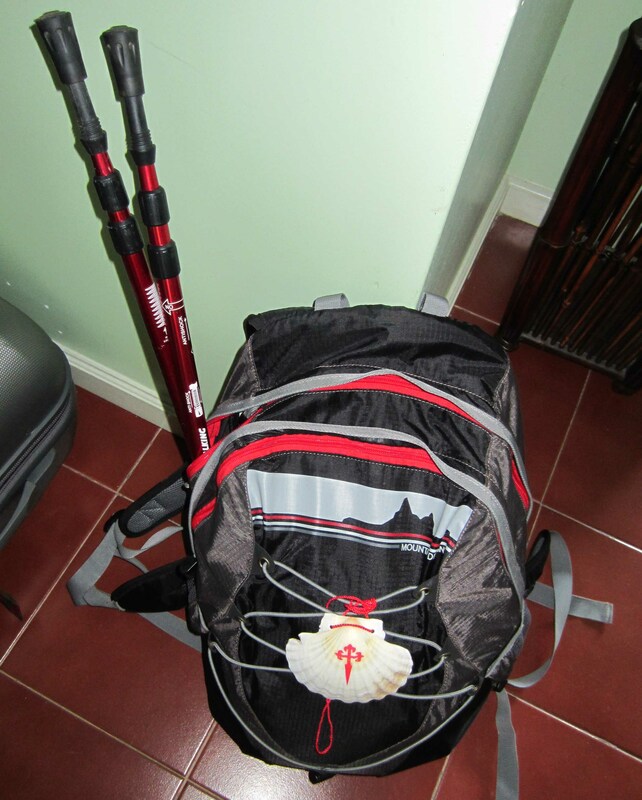 The scallop shell on my backpack identifies me as a Camino pilgrim. A milestone heaped with pebbles of sorrow. Note the number below the tile… just 70 kilometres more to Santiago. 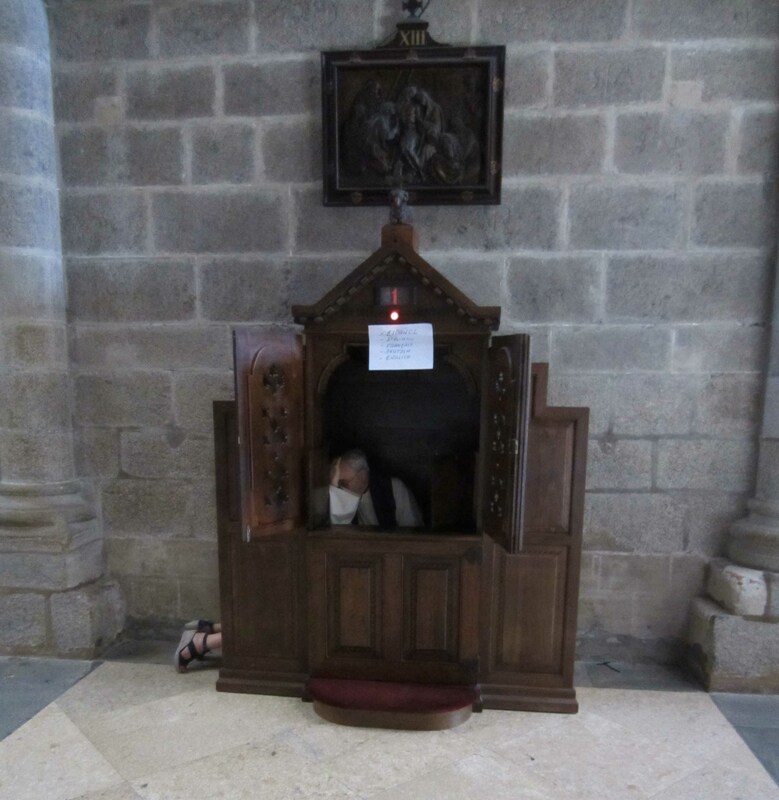 As I reported in an earlier post [The mystique and the shadows of the Camino, posted July 29th] some pilgrims believe you can pick up a stone, put your sorrow into it, and disburden yourself of that sorrow when you put the stone down. Some carry stones from their homes all the way to Santiago de Compostela cathedral, others abandon their stone in certain special places like the heights of Cruz de Farro on the Via Frances, still others do the ritual “in instalments”, picking up stones and relinquishing them as they walk. On the Via Portgues some waymarkers are piled high with stones, and stones litter the ground around many wayside crucifixes. Emmy lets go of her sorrows (rather small ones). 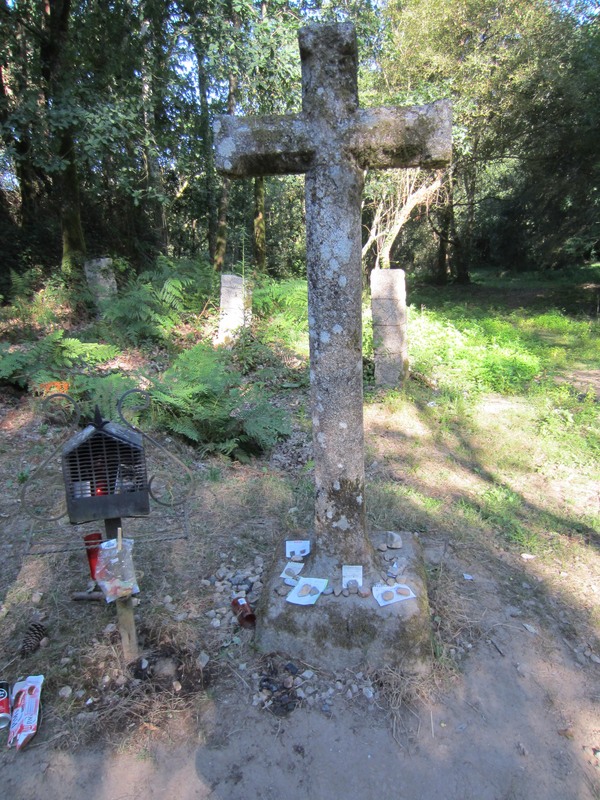 A wayside cross littered with stones of sorrow at a high point in the Camino trail in northern Portugal. A typical wayside cross with Christ above and a pilgrim below. 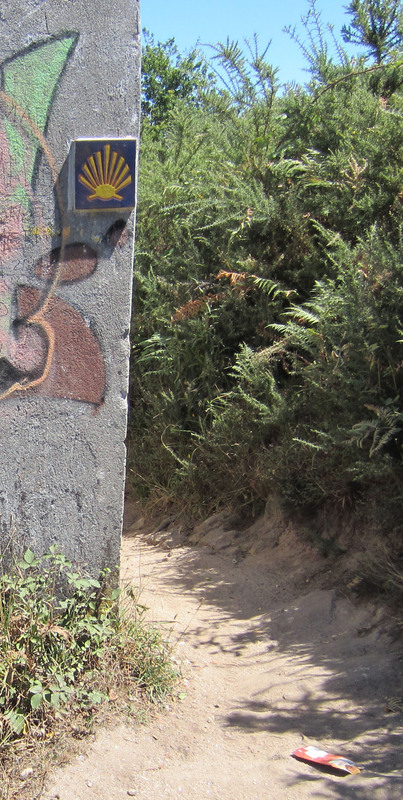 Like decorated letters that punctuate the lines of an illuminated manuscript, the tracks of the Camino are punctuated by exotic wayside crosses, tiny niche-in-a-wall shrines and small chapels that are filled with symbolic pith. Some seem to function like roadside guard houses – places where Jesus is thought to keep a protective watch over the passing current of pilgrims. 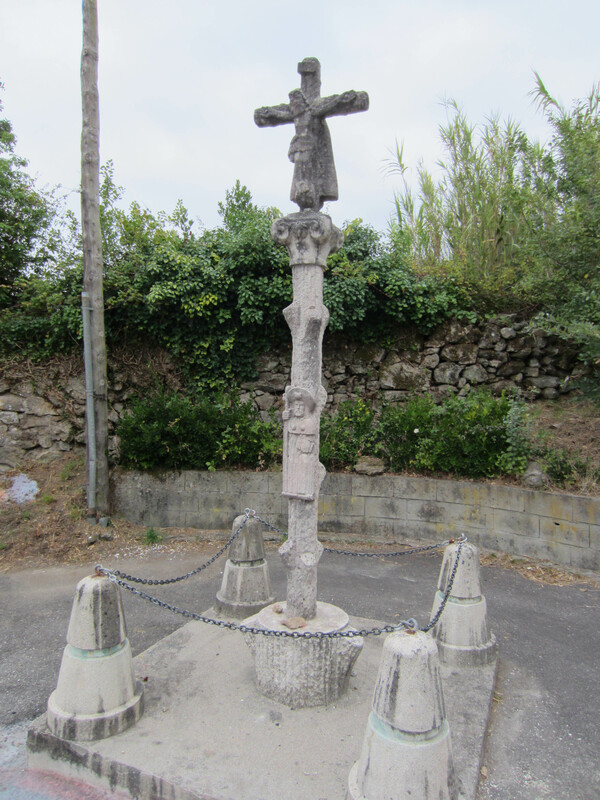 Quite a few wayside crosses are carved with effigies of Christ on the cross. Below him, on the shaft of the cross, there may appear a weathered image of a pilgrim complete with walking staff, water gourd and scallop shell. Some crosses are festooned with paper prayers and messages left by passing pilgrims. For the weary walker there are few sights more welcome than a wayside chapel. Inside you find quiet respite from the relentless unravelling of distance under your feet. The heat, noise and dirt of the road shrink away. For a short time at least, you can wonder at the stillness and allow it to refresh you before you step out again into the incessently moving world of the walk. 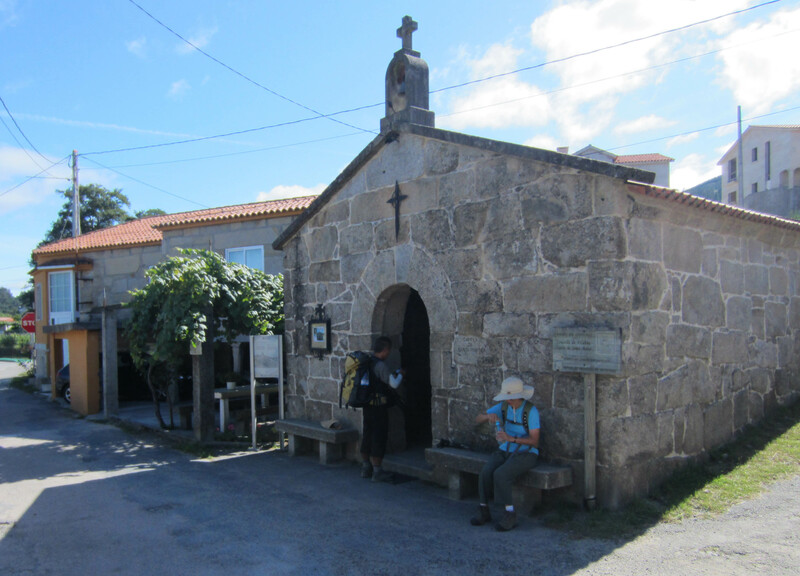 A small roadside chapel between Redondela and Pontevedra in Galicia, Spain. Inside a wayside chapel, an image of “Christ of the Good Journey”. 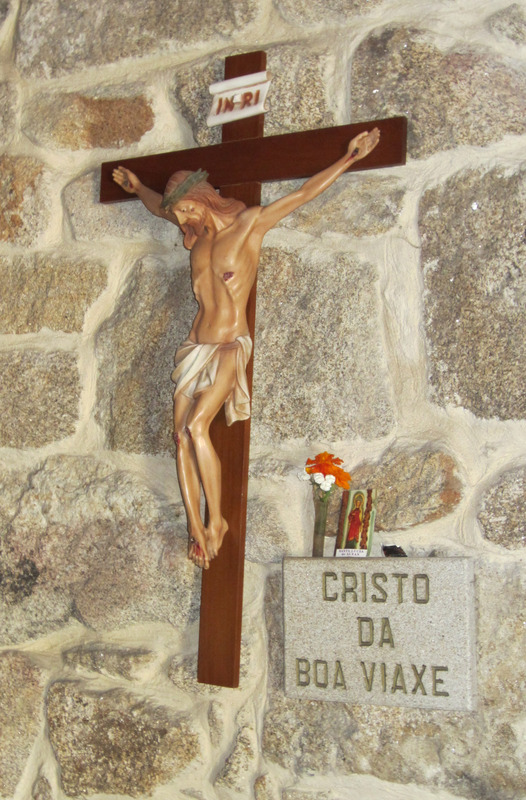 A tiny makeshift shrine, stones of sorrow and paper prayers surround a wayside crucifix near O Porrino in Galicia, northern Spain. It is a tradition for walkers on the Camino to greet one another, and to be greeted by non-walkers, with a special cheery phrase: Bom Caminho (pronounced /bong.ka.MEEN.yo/) in Portuguese, and Buen Camino (pronounced /b’wen.ka.MEE.no/) in Spanish. Translated into English the greeting means something like “Well may you fare!” I may be wrong, but I think I heard a Galician variant of the phrase in north-west Spain. It sounded like /b’wen.ka.MEEN.yo/, sort of halfway between the Portuguese and Spanish variants of the greeting. On the Via Frances there is a well-developed chain of hostel-type lodgings especially for bona-fide pilgrims. 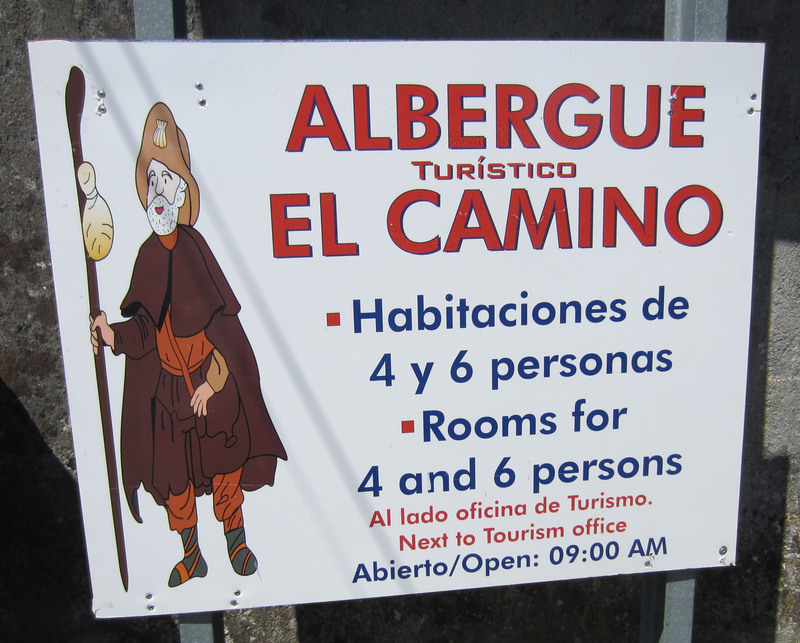 Called albergues or refugios they offer toilets, showers, bunk beds in dormitories, and simple kitchen facilities, all at a very nominal cost. This network is not so well developed along the Via Portugues, but there too the number of albergues is growing rapidly. Being too attached to bourgois comforts and the old-fashioned notion of privacy, Emmy and I did not stay in albergues. Instead we pre-booked accommodation that included breakfast and an evening meal in small hotels and B&Bs. Without exception these turned out to be comfortable although far from luxurious, with an especially warm welcome for pilgrims. On the road, and in many of our overnight lodgings, we were able to order meals from a “pilgrims’ menu”. Meals on the pilgrims’ menu are slightly cheaper than standard meals, but the food is generally good, no-nonsense fare. An average pilgrim meal might consist of a soup entree, a meat dish (usually pork) with vegetables (usually boiled), and a dessert of fruit. Prices range from €7.00 to €12.00 including local wine and a cup of coffee or tea. In short, it is a good deal. 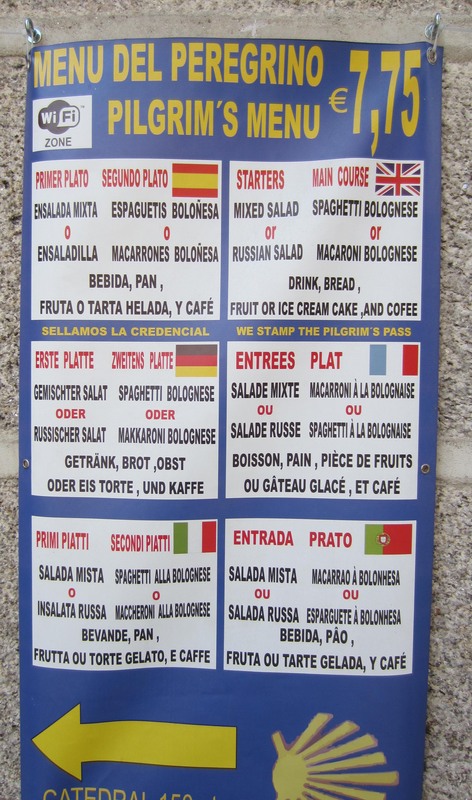 Multi-lingual advertisement for hungry pilgrims. Tuy, north-western Spain. 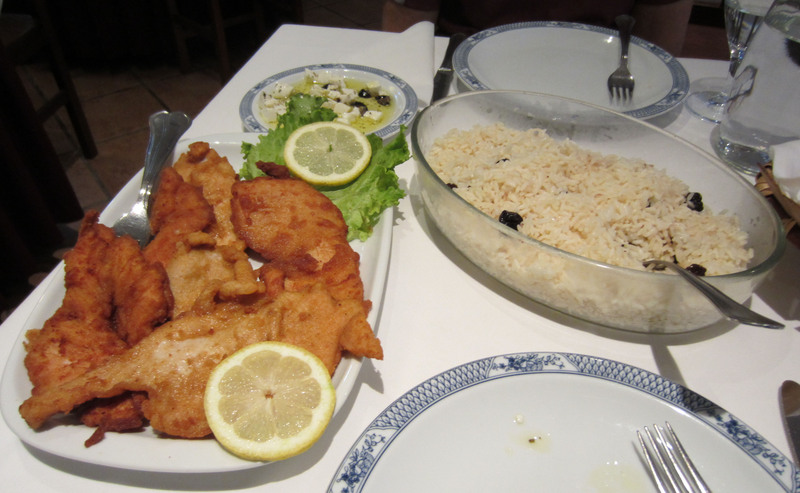 A typical meal from a pilgrims’ menu: cheese and olives (top), rice and fried chicken. Served at the Casa Cecilia Restaurant, near Vilarinho, Portugal. It cost eight fifty Euros per person, including a soup entree and a cinnamon apple dessert. In Santiago de Compostela and in a few places beyond the city, you can buy a special Tarta de Santiago, “cake of St.James”. 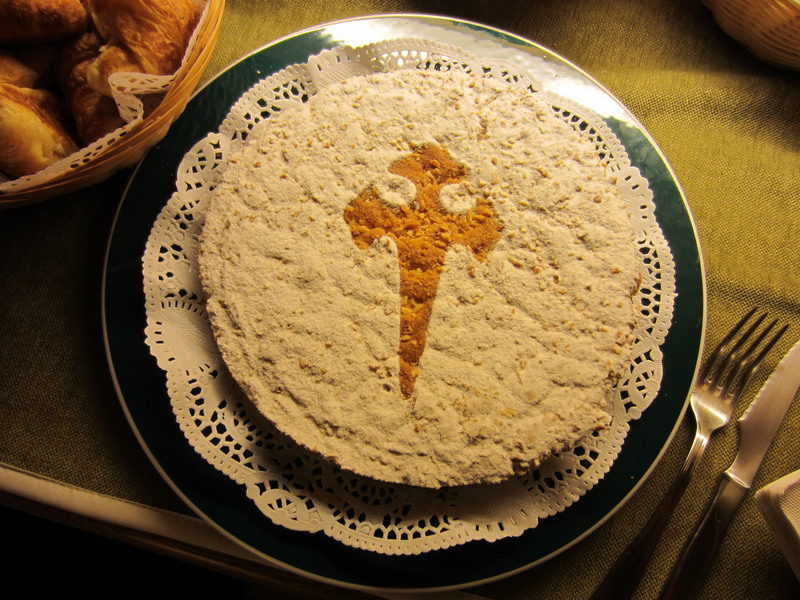 This is a round, almond flavoured cake, sprinkled with icing sugar and embossed with a stencilled cross of Santiago. 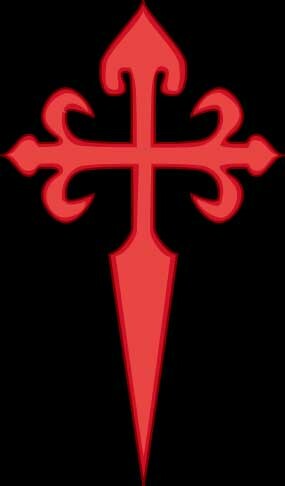 The cross of Santiago is an ancient icon, probably derived from the age when Santiago was the celestial patron of the Christian armies that – for some 700 years – harried Iberia’s Moorish rulers. The shaft of the cross tapers into a piked point like the blade of a sword, while the arms and the head are split and peeled back into the triple curls of a stylised fleur de lis. 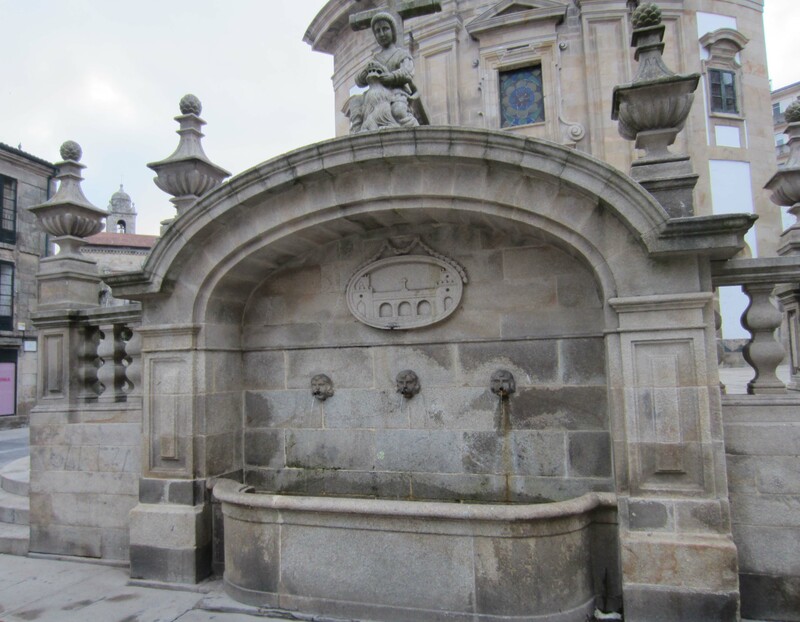 A compostela is a certificate in Latin issued by the cathedral of Santiago to pilgrims who have completed the Camino pilgrimage “impelled by religious devotion” (pietatis causa). To meet the cathedral’s definition of satisfactory completion pilgrims must walk at least the last 100 kilometres to the cathedral end-point. Most pilgrims walk much further than the minimum. The Via Frances, for example, extends about 800 kilometres from the Pyrenees to Santiago, even further if you take Le Puy or Paris or Vezelay or Arles (all in the deep interior of France) as your starting point. Emmy and I walked 230 kilometres along the Via Portugues from our beginning point in Porto, northern Portugal. You are allowed to cut your walk into stages and complete them at different times with intervals between each stage. In order to get a compostela you must provide the cathedral with evidence that you have properly completed the pilgrimage. 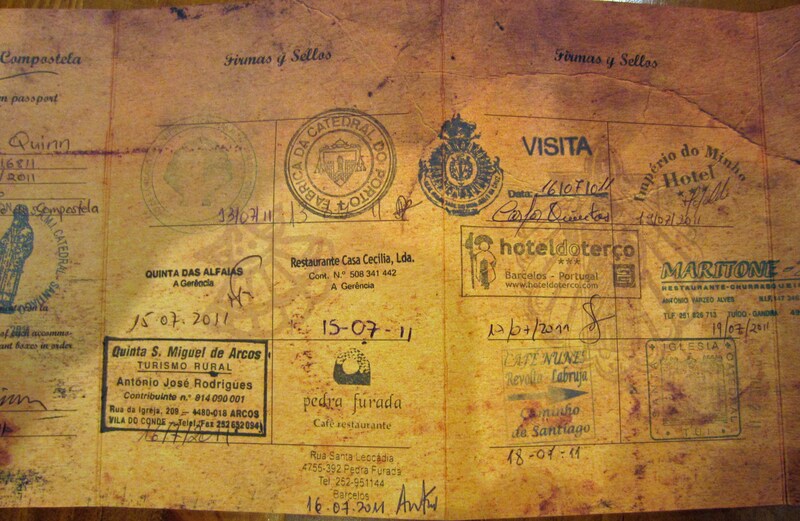 This takes the form of a document called a credencial or “pilgrim passport” which you fill with rubber stamps collected from from churches, albergues, restaurants and other places along the Camino way. Some restaurants even advertise their stamps to lure pilgrims in for a meal. At a pinch, a credencial can be simply a piece of paper, but mostly it takes the form of a concertina of printed cardboard issued by a pilgrim support organisation, a travel company or an albergue. 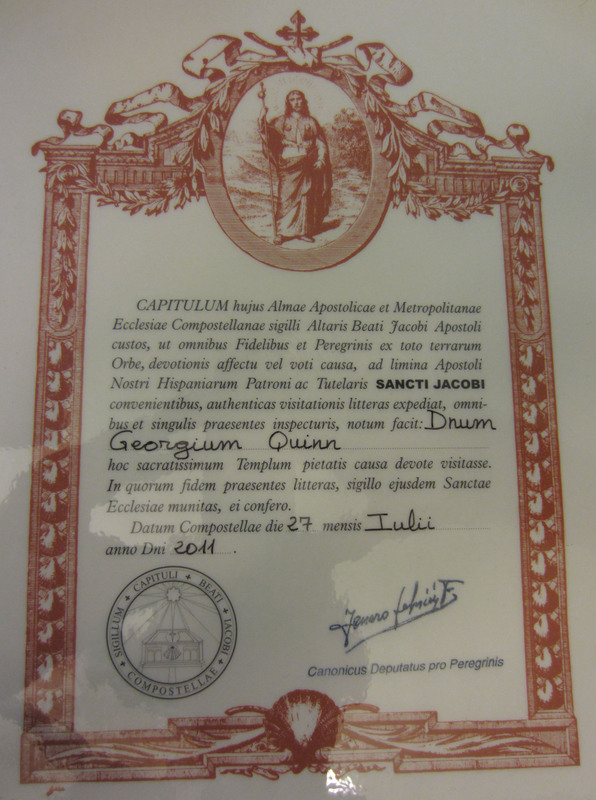 (For an example of what a credencial can look like see: http://www.americanpilgrims.com/camino/credential_cover.html.) The sequence of stamps in the credencial is carefully examined in the Pilgrim Affairs Office (Oficina de Acogida de Peregrinos) at the cathedral, and if it fulfills conditions a compostela is issued on the spot (see Our last day on the Camino posted August 5th). The credencial has other functions and benefits. To ensure that guests in an albergue are bona fide pilgrims and not freeloaders trying to chisel a cheap night’s accommodation, credencials are carefully examined when walkers check in. And as I discovered at Tuy General Hospital, other doors too can be opened upon production of a credencial (see I get medical attention in Tuy posted July 26th). Part of my credencial, or pilgrim passport, with stamps from churches, hotels and restaurants. Every day at 11.00 a.m. there is a special pilgrim mass in the cathedral of Santiago de Compostela. It is an exotic experience. An hour before proceedings start the cathedral’s ranks of simple wooden pews are already filling up. Left and right, at intervals along the wall, anxious communicants kneel in hut-like wooden confessionals while priests lean solemnly towards them cocking their heads to take in tales of sin while gazing out at the ragged throngs eddying down the cathedral aisles. Newly arrived walkers mill in sweaty clusters, their swags and backpacks heaped on the flagstone floor. They quietly squeeze into seats beside nuns and primly dressed women with heads veiled in filmy lace. Every few minutes the buzz is quelled for a few seconds with a loud “SH-SH-sh-sh” that hisses from the public address system. By 10.30 it is standing room only. Ten minutes before the start of the mass a nun appears on the raised apse and with grandiloquent gestures, portentiously rising on her tip-toes and solemnly descending, she leads the congregation through a rehearsal of the sung liturgy. Then a barricade of priests appears in white frocks and long red stoles hanging to the floor from their necks. The mass – conducted in Spanish with a few passages of German – gets under way. A waterfall of music tumbles over the congregation from organ pipes that project horizontally from the walls of the nave. The choir sends its criss-crossing lines of song up into the ornate ribs of the distant ceiling. The presiding priest reads out the number of pilgrim arrivals from the previous day and their countries of origin. Emmy and I strain to catch the echoing nuances of the Spanish, and yes, there we are: “two arrivals from Australia”. 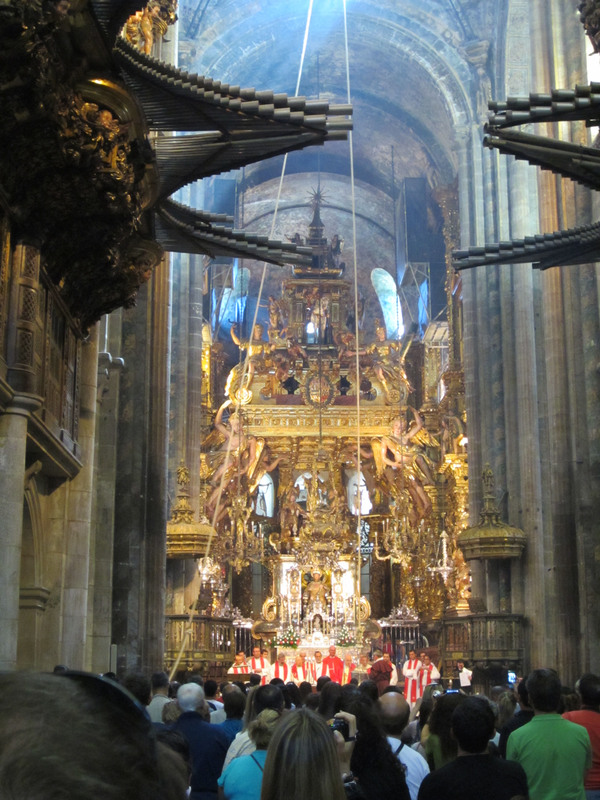 The climax of the mass is the ritual burning of incense in an enormous bronze thurible, called the botafumeira. After lighting it, a squad of priests hoist it above the congregation and energetically swing it like a giant pendulum left and right across the transept. A bluish haze of smoke rolls up into planks of light that slant down from the dome far above the upturned faces of the congregation. Smiles break out. Children point. Cameras flash. A priest hears confession inside Santiago cathedral. The kneeling legs of a repentant sinner protrude at the left. According to the sign on the confessional the polyglot priest can hear confessions in Spanish, Italian, French, German and English. The atmosphere in Santiago cathedral during the pilgrims’ mass. Note the ropes used to raise and swing the botafumeira thurible. Most interesting! Though I’m wondering how you fitted yourself into the “pietatis causa” requirement. (I see you wisely ignore the matter.) And would you believe it: at first glance I took your back-pack for a decadent modern version of the iberian bagpipes!! However these remarks are very mal-pensant and should probably also be ignored!